PEO Soldier Releases New ATK XM25 (also written XM-25) Counter Defilade Target Engagement (CDTE) System 25mm Airburst Grenade Launcher Promotional Video | DefenseReview.com (DR): An online tactical technology and military defense technology magazine with particular focus on the latest and greatest tactical firearms news (tactical gun news), tactical gear news and tactical shooting news. PEO Soldier has published a new promotional video on the ATK XM25 (also written XM-25) Counter-Defilade Target Engagement (CDTE) System 25mm airburst grenade launcher on Vimeo. Our friend “Steve” at The Firearm Blog has made an interesting point about the seeming lack of lethality of the 25mm airburst grenade round if it fails to detonate directly over the target. However, from the video, it would appear that the round will still be at least fairly effective if it detonates directly in front of the target or directly in front of and above the target. It’s when the round detonates immediately above and behind the target that it would appear to be at it’s least effectiveness/lowest lethality quotient, since the round’s detonation pattern, combined with its forward momentum, lacks enough rearward-directed shrapnel to be lethal. Hopefully, the XM25 with “fully-integrated” L-3 Brashear XM104 ruggedized Target Acquisition and Fire Control (TAFC) system (with targeting laser for measuring distance to target) and time-fused High Explosive Airburst (HEAB) 25mm projectiles’ (genades) respective targeting and time-fusing system will be precise enough to reliably detonate the rounds either directly above the target or slightly in front of (or slightly in front and above) the target. It’s been known for some time that 25mm is the minimum size the round can be in order to achieve adequate lethality, and it’s still very close to the minimum lethality threshold. Rembember, back in the highly-troubled XM29/OICW (Objective Individual Combat Weapon) days, the round was initially a 20mm grenade round, but 20mm simply wasn’t sufficient. While DefenseReview (DR) has been publishing information about the XM25since its early prototype phase in 2005, it wasn’t until we ran the XM25 weapon simulator that we got to actually (viscerally) experience the potential combat ramifications of the weapon, ourselves. Assuming the fully-developed and fielded production version of the XM-25 works as effectively as the simulator version, as we published in our most recent article on it, it’s going to be a real game changer for infantry combat, particularly in urban warfare environments. It would be interesting to do a side-by side infantry combat-effectiveness test between the XM25, Milkor USA M32 MGL (Multiple-shot Grenade Launcher) and MPS AA-12 (Auto Assault-12) machine shotgun (full-auto combat shotgun), once both the 25mm grenade rounds and FRAG-12 grenade rounds are fully developed. Defense Review is also interested to see the final cost difference between both weapons and ammo types, as well. At present, the XM25 appears to be many times more expensive than both the M-32 MGL and AA12 shotgun. It should be noted that both the M32’s 40mm grenades and FRAG-12 grenade rounds impact-detonate-only, and do not have time-fused-detonation capability. Several versions of the FRAG-12 are designed to penetrate light armor, however. 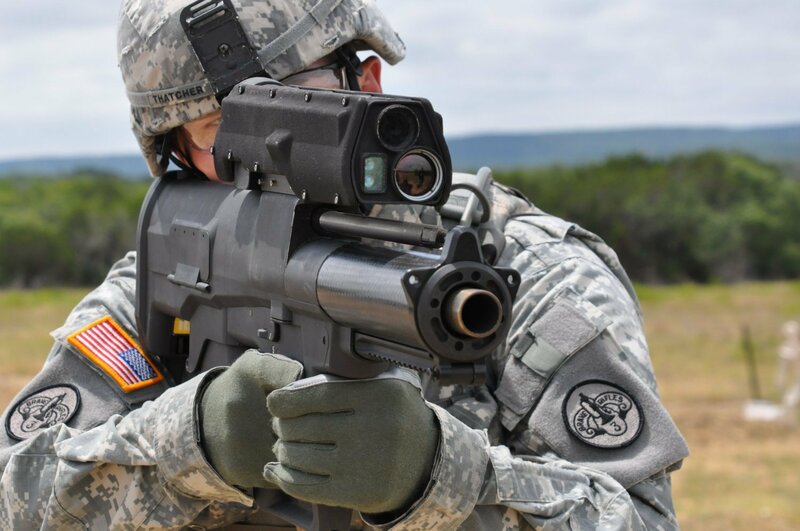 Oh, and by the way, PEO Soldier just awarded XM25 prime contractor Alliant Techsystems (ATK) with a brand new $65.8M ($65.8 million) contract for continued development and testing over the next 30-months. It must be nice to be a U.S. government contractor. Military Police Systems (MPS), Inc.